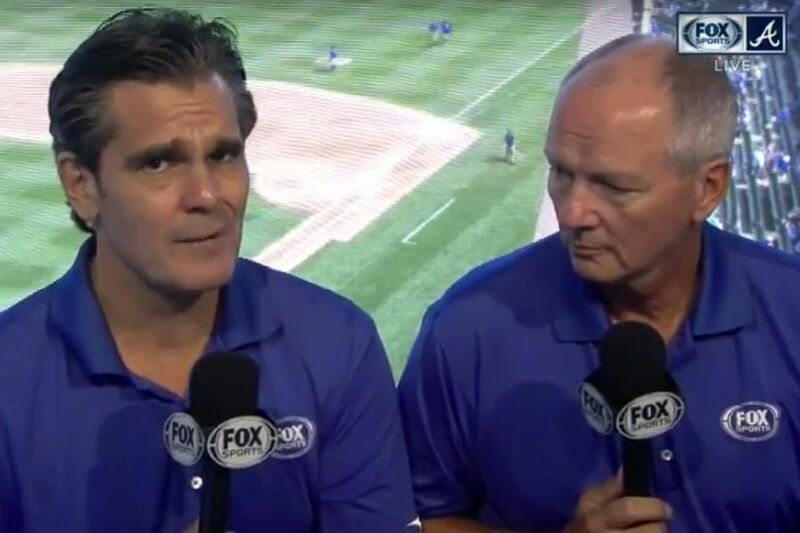 Atlanta Braves television analyst Joe Simpson (left) is once again being criticized for comments he made about a player during a broadcast. It's been a rough two weeks for Joe Simpson, a former MLB outfielder who has been the television analyst for the Atlanta Braves for 27 years. After apologizing for a harsh rant he made about Los Angeles Dodgers second baseman Chase Utley at the end of July, Simpson has once again become the target of criticism, this time for comments he made Tuesday night about the age of Washington Nationals rookie Juan Soto. During the seventh inning of game one of a double-header between the Braves and Nationals, both Simpson and play-by-play announcer Chip Caray praised Soto, a strong Rookie of the Year candidate who was called up from AAA in May. Soto, who sports a .315 batting average with 14 home runs and 39 RBIs, became the first teenager in MLB history with a four-hit, two-homer game against the Phillies on June 30. But during his praise of the young slugger, Simpson also questioned Soto's official age. According to the Nationals, Soto was born Oct. 25, 1998, in Santo Domino, Dominican Republic. "He is… if he's 19, he has certainly got his man growth," Simpson said on Fox Sports South. "He is big and strong." That comment earned Simpson another round of criticism, as baseball writers quickly pointed out there is no evidence that Soto or the Nationals have been lying about the young slugger's age. "Age fraud hasn't been a thing in Latin America in nearly a decade. But then again Joe Simpson is stuck in the past, so it's not a surprise that he proffers this sort of garbage. Ignore it," wrote Yahoo! Sports baseball columnist Jeff Passan. Age fraud hasn’t been a thing in Latin America in nearly a decade. But then again Joe Simpson is stuck in the past, so it’s not a surprise that he proffers this sort of garbage. Ignore it. Simpson's comments also earned a strong rebuke from Nationals general manager Mike Rizzo, who confronted Simpson about it, according to The Athletic's Ken Rosenthal. "I had a definite reaction," Rizzo told The Athletic. "I handled it face to face, privately with him. I believe he understood my stance on his comments." During game two of the double-header, Simpson addressed the controversy on air, confirming that Soto was indeed 19 years old. "If you were with us in game one, you might have heard me make a comment off the top of my head about if he's 19," Simpson said on Fox Sports South. "Well, he is. He's bonafide 19. And he is a full-grown man. He is strong. And he is one heck of a player. You might well just write his name in on the Rookie of the Year award right now." Earlier this summer, Simpson was forced to issue a formal apology after an ill-advised rant about Utley during a July 28 game between the Dodgers and the Braves. Simpson called the 16-year-veteran "unprofessional" and "an embarrassment" for donning a T-shirt during batting practice. "I think about fans that come to Sun Trust Park who were Dodgers fans and want to see their players. They had no idea who any of them were," Simpson said. "Chase Utley, I've had nothing but respect for his whole career, I think he's a great player, I thought he always played the game the right way. That was an embarrassment, what he had on during batting practice. "That's a complete lack of respect for the fans and the game," Simpson continued. Walter Alston would roll over in his grave if he saw that," referring to the Dodgers Hall of Fame manager who retired in 1976, before a single member of the team was actually born. Among those angry over Simpson's comments was Dodgers manager Dave Roberts, who defended his second baseman's choice of batting practice attire. "You're talking about Chase Utley who is a consummate professional not only on the field but off the field, wearing a 'Strikeout Cancer' shirt, a cause that is dear to his heart," Roberts told reporters.